I am so excited to be taking Dexter on his second holiday abroad and this time we are going to Spain. The thought of travelling abroad with a toddler can seem daunting, but follow these tips and it will be plain sailing! Our first holiday was back in April and we spent four days in Majorca. We learnt a lot from that trip which of course I wanted to share with you. This time we are flying into Barcelona, before transferring to Lloret de Mar where we have booked into the Aparthotel Costa Encantada for six nights. 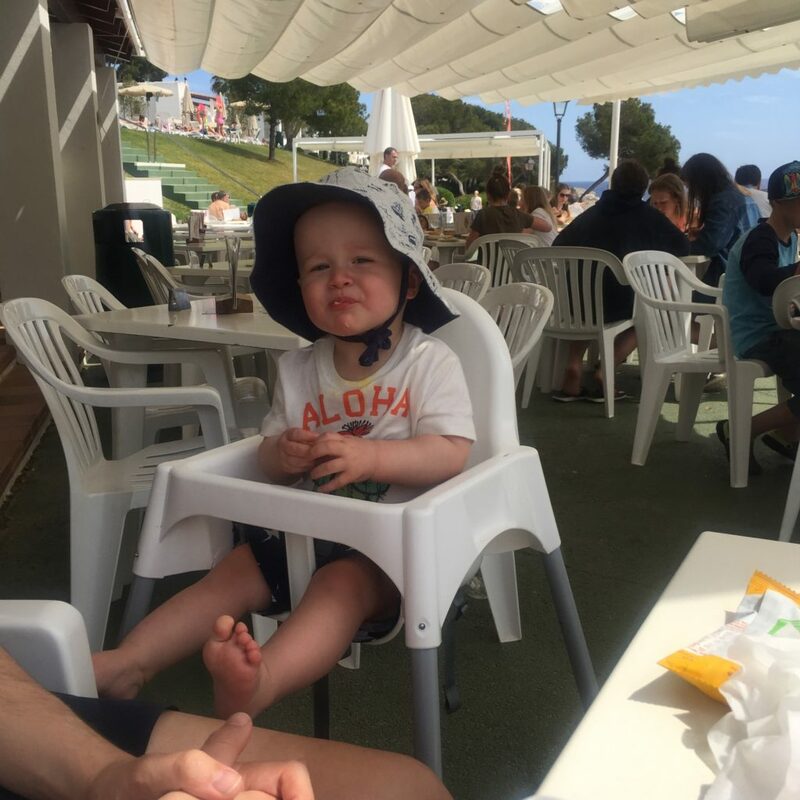 If you book your holiday last minute (like I always do) and are panicking about how you are going to cope with a baby/toddler on your first holiday away, read on! Don’t get me wrong, I usually love Ryanair. In 2010, I travelled with them across Europe visiting Italy, Finland, Latvia, Norway and Germany, taking seven flights which cost me less than £50. However this week, they’ve really taken the biscuit. This week Ryanair announced they are cancelling up to fifty flights per day affecting 2% of their schedule. This is caused nothing but headaches for holidaymakers including myself, who had no idea if their flight has been cancelled because they were only announcing them 48 hours before departure. After increasing amount of pressure from the media they finally released the full list of cancellations. Luckily, our flight wasn’t affected, but so many others are having to deal with the consequences. Read the full list here. Save money by travelling with hand luggage only. 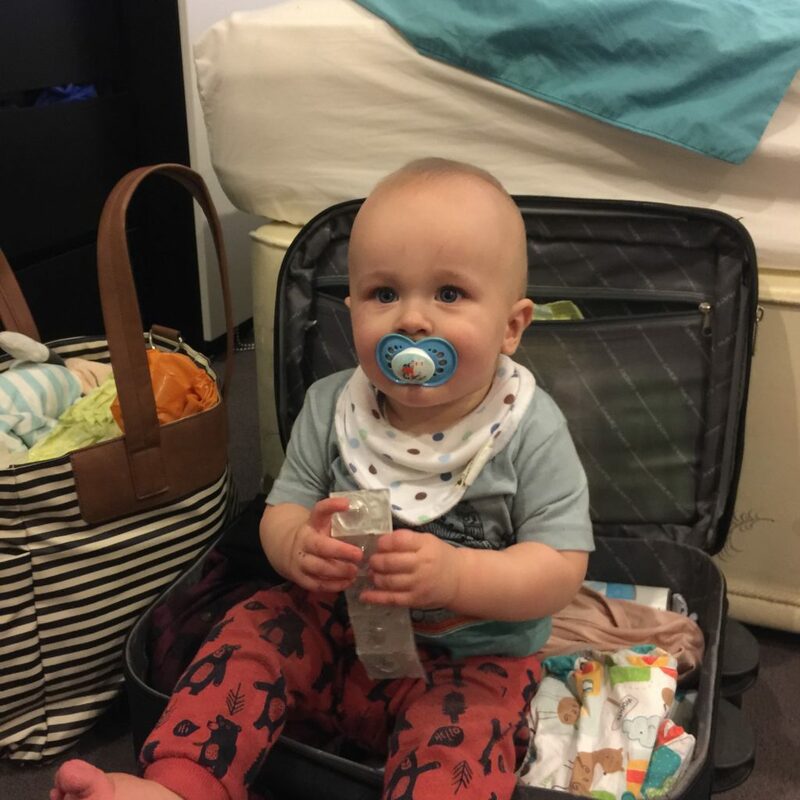 When you are travelling with an infant, you may think it necessary to pay extortionate fees to put a huge suitcase in the hold, but trust me, you can travel with everything you need as hand luggage only. Flying with an infant means you should be entitled to one suitcase weighing no more than 10kg per adult, a baby bag weighing 5kg, one pram and/or car seat plus any bags you pick up in duty free. My advice is to not pack your 10kg suitcase full of formula, nappies, sunscreen and food and instead pre-order it from Boots online to pick up airside. It won’t affect your weight limits and you probably won’t have any of it left when you travel back. You can do the same with shampoo, toothpaste, shower gel etc, meaning you don’t need to worry about carrying liquids which are over 100mls. Avoid over packing by planning what outfits to take instead of bundling a pile of clothes into your suitcase. I already lay out which clothes Dex will be wearing on a Sunday evening for the week ahead and it’ll be the same for the holiday. Last time I took day and night clothes which I won’t be doing this time. After dinner he is ready for his pyjamas and a snooze! As for Mummy, ditch the hairdryer because the hotel room will probably have one and forget the straighteners because holidays are all about beach waves anyway! If you are travelling to Spain during October half term like we are, chances are it’s going to be quite cool during the evenings and if you have baby/toddler sleeping in a pram while you are out and about, make sure you have suitable sleepy wear for them. We love the Antipodes Merino sleep bag which keeps baby cool in summer but warm during the cooler months. We will also be taking our trusty Zeta Citi stroller which folds up like a dream but also reclines for relaxing evening snoozes. For the evenings we decide to stay in, we made sure we booked an aparthotel so that there is a seperate living area meaning we can chill and watch a film while toddler sleeps soundly in another room. I always like to book evening flights where possible when I am travelling with a baby/toddler so that they can sleep for most of it in my arms. If this isn’t possible, make sure you arm yourself with tons of snacks, an iPad and toys galore. Nicola from IAmCrabstix recommends children’s magazines and an iPad. They do In the Night Garden and Hey Duggee magazines which you can pick up in the airport and they come with toys and stickers usually. The BBC iPlayer kids or Sky kids app on iPad allow you to download shows meaning you can take their favourites with you! Hayley from Devon Mama recommends toys galore. We bought those water colouring sets, you fill a pen up with water and ‘draw’ on the page to bring out the colours. It kept him entertained for ages! Plus, there’s no chance of scribbling on anything else as it’s just water. Once the page dries, it returns back to white again. The other big hit was a duplo mini tractor set (my first tractor). There were enough bits that he could practice putting the blocks together but not enough to drive you crazy. It comes with two vehicles (a tractor and a trailer), he spent both flights and the entire holiday driving those along things. Be smart with your travel money. The rate on the euro has hit a ten year low due to all the uncertainty around Brexit so travelling within the Eurozone is becoming more costly for us Brits. If you insist on carrying cash, the best rates can usually be found if you pre-pay online and pick up at the airport. Never, ever convert your sterling at the airport on the day because the rates are absolutely dire. You’ll probably find at the moment that they’re less than one for one. A credit card that is free to use overseas is always a bonus because it usually attracts the Mastercard or Visa rate of the day which is considerably higher than those you see in the local bureaux de change. Some of these credit cards are even free to withdraw cash from the ATM which saves you having to convert lots before you travel. Post Office, Halifax, Barclaycard and Nationwide all offer free use abroad credit cards. Always avoid using a debit card that charges. I find the worst culprits to be Natwest and RBS who add a cash fee for every transaction on top of a percentage fee of what you’ve spent. One of my friends racked up £111 in charges just from using her RBS card on her two week holiday this summer. I also recommend taking a pre-paid card travel card, just as an extra back up and I love the one from Post Office which can be preloaded with up to thirteen different currencies. I’m a little bit obsessed with making sure we have covered all of the options incase we ever run out of money abroad and I love this particular card because it can be couriered out to you within 48 hours if you lose it. I’m a mom travelling with her kids. It’s not a vacation, it’s a business trip! It took me years to stop lugging the hairdryer along with me on holiday, although I’ll never relinquish the straighteners… my hair goes into full frizz mode with even the slightest bit of heat!